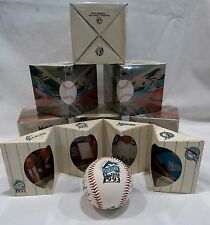 TWO MARLINS BASEBALLS 1997 IN A PLASIIC BOX.LOGO ON BOTH.SEAL ON BOX SAYS SPECIAL LIMITED EDITION. This is from my personal collection and I've had this ball since 97, I was 16. I know these are rare, There is a lot of Clones but nothing like this. I am not into baseball like I use to. Gimmie Cards will meticulously package and promptly send your collectibles the same business day you place your order. Items are exactly as pictured and described with no surprises. We are always happy to answer questions and combine shipping so drop us a line! Florida Marlins, Inaugural Year Baseball,In Case. 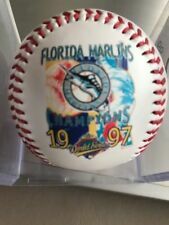 Florida Marlins baseball, inaugural year, collectors item, 1993, mint in case. This is a Chevron Team Stars 1994 Fotoball, with a great image of Gary Sheffield on one side & the Florida Marlins logo on the other side. This was a promotion sponsored by Chevron Gasoline Dealers in 1994. Make Supersized Seem Small. The set includes both baseballs and the cases they are shown in. Get Images that. Florida Marlins. (displays on an acrylic base with cover). This item was part of my personal sports memorabilia collection. It is in very good condition with only minor flaws in the silver Marlins logo as shown in the photos. 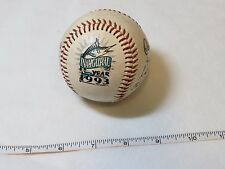 Florida Marlins Commemorative baseball team logo Limited Edition Fotoball . Shipped with USPS First Class Package. BALL TYPE : Official World Series. BALL MANUFACTURER : Rawlings. When Wayne Huizenga announced the Florida Marlins I wrote a letter asking about ticket information and playing dates. You get both baseballs at this price. Vintage Florida Marlins 1993 Souvenir Baseball Bat 18"
Souvenir Florida Marlins bat from 1993. Bat is 18" long and in great condition. Vintage Florida Marlins 1993 Souvenir Black Baseball Bat 22"
Black souvenir Florida Marlins bat from 1993. Bat is 22" long and in great condition. This ball, still in it's original box, was only taken out for photographs and is in flawless condition. Inaugural Baseball in a Ball Qube, Inc. Plus a bonus 10" Mini Bat. 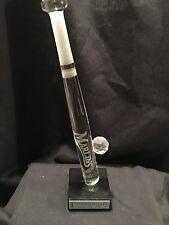 VERY CLEAN, DISPLAY PIECE ONLY, NEVER THROWN. INAUGURAL SEASON. 1993 FLORIDA MARLINS BASEBALL. ORIGINAL SEALED BOX. Player - ORESTES DESTRADE. FLORIDA MARLINS BASEBALL with PHOTO. 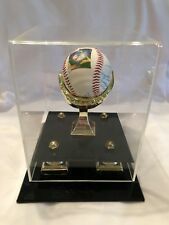 FLORIDA MARLINS SPINNEYBECK LEATHER BASEBALL. Joe Robbie Stadium. INAUGURAL SEASON. 1993 FLORIDA MARLINS BASEBALL. Brand new and still in packaging. This ball has the original logo and perfect for autographs. 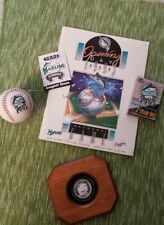 Rare Items-Florida Marlins Inaugural Season Memorabilia Nice!!! (A wonderful addition to any collection. 12) Marlins bear signed by Owner Wayne Huizenga (truly a one of a kind item). Spring Training workout schedule (one of a kind historical item complete with infield clay smudges).